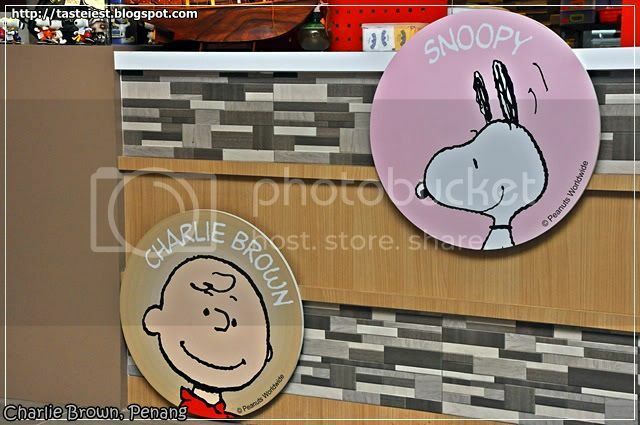 Charlie Brown Café grand opening at Penang finally, theme café after nurse café, toilet café and prison café. 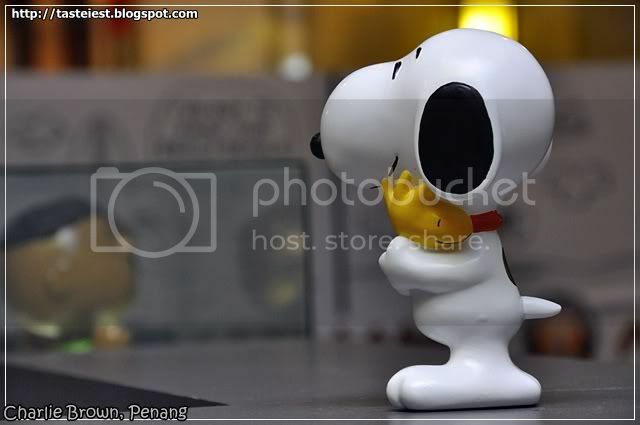 Charlie Brown was not that well known as his pet name Snoopy, which is well known by everyone, it as everyone childhood memory where a beagle fictional character in the long-running comic strip Peanuts. 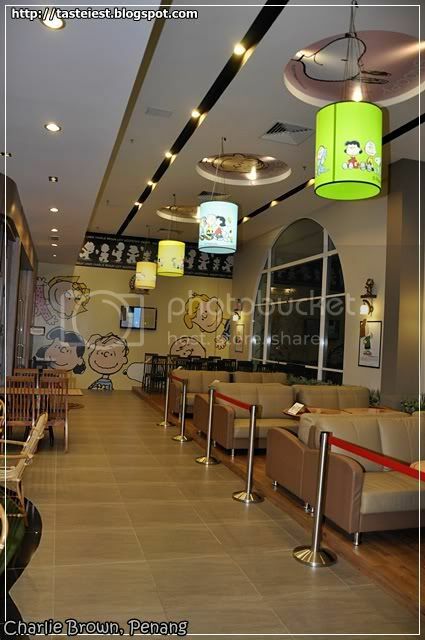 Charlie Brown Café located at first floor of Strait Quay with attracting cartoon drawing all over the external wall and cute internal design as well, ceiling fill with the lovely character of Charlie Brown and Friend picture. 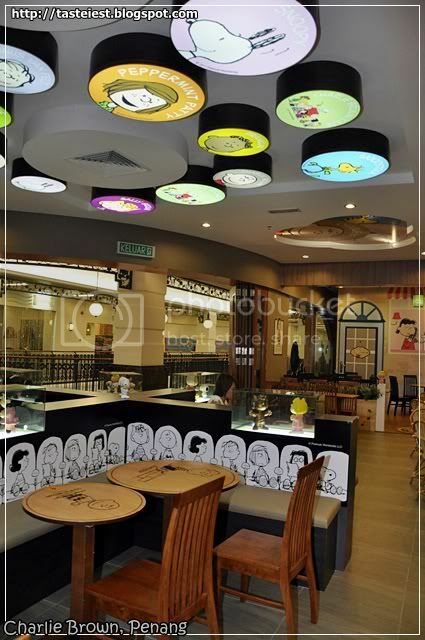 Table, Chair, Wallpaper, Cup and even food decorated with different character design. 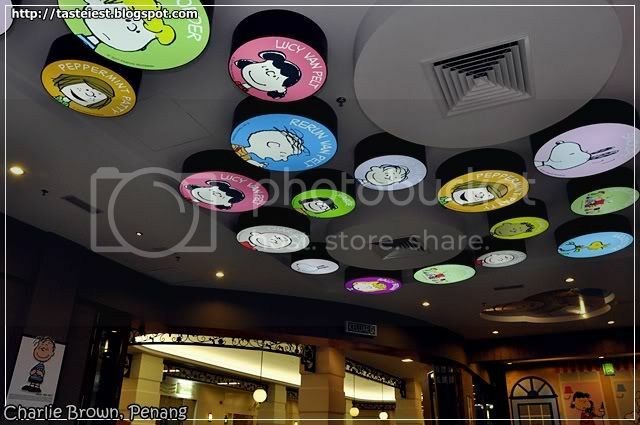 Lovely ceiling decoration, it definitely attract kids to dine in this restaurant. Different type of sitting area provided such as comfort sofa or normal dining table, too bad during our visit comfort sofa session is closed where a nice sea view is available from this spot. 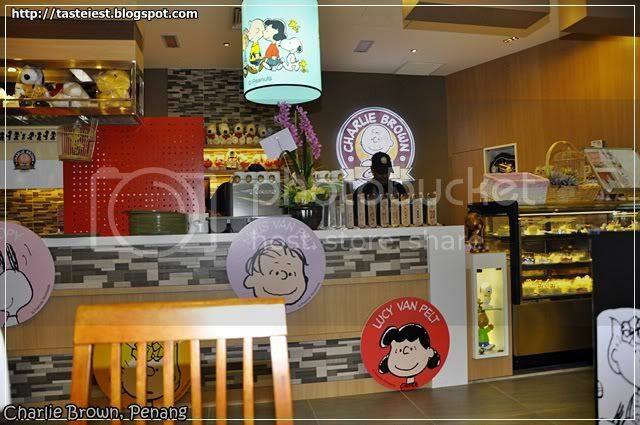 Charlie Brown café operate like fast food style, where you need to place your ordered at counter and wait for your food to be deliver. We caught in surprise when fist look into the menu where just a few main dish is available and the drink is very expensive. 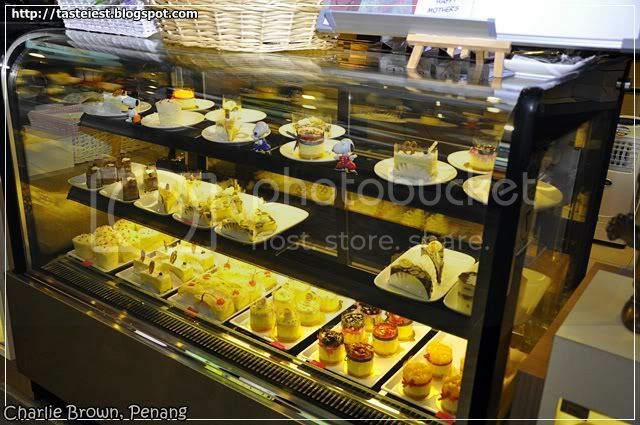 Dessert bar, various type of dessert available for selection. 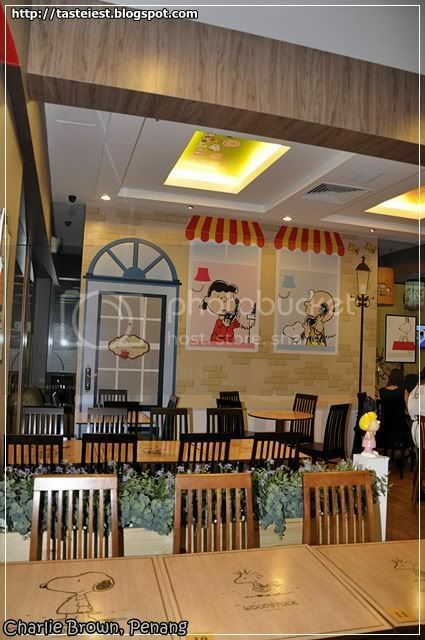 It make me feel like they are operating in a way like Secret Recipe where their main intention is for chit chat dining instead of stomach filling dining as the menu shown more toward dessert and drink instead of main dish. 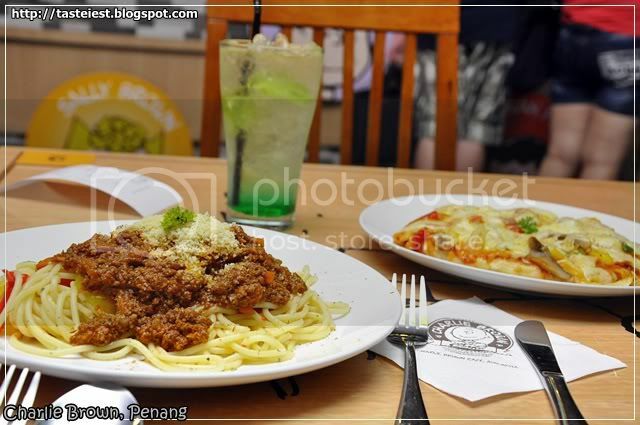 Food serving is pretty fast as there is only few type of main dish available and most of the dish is pretty simple. 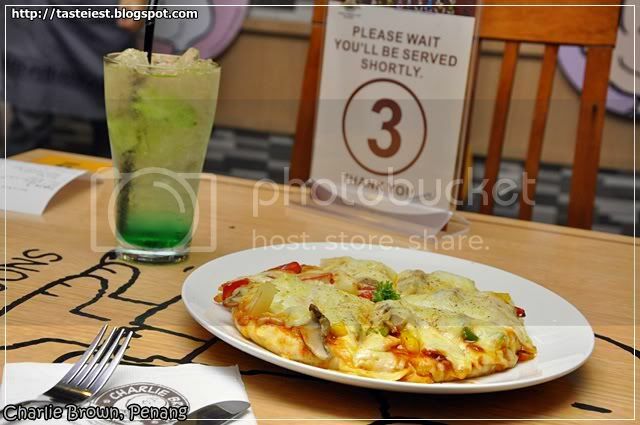 Apple Mint RM10 and Charlie Brown 8” Chicken Pizza RM15.80, Apple Mint drink taste just normal as it has too strong Apple Essence flavor which turn out to be medicine taste. 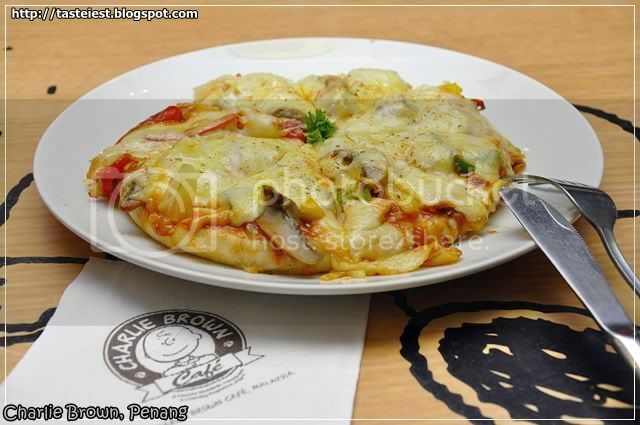 Charlie Brown 8” Chicken Pizza RM15.80, 8” Pizza fill with green capsicum, red capsicum, yellow capsicum, mushroom and ham top with lot of cheese. 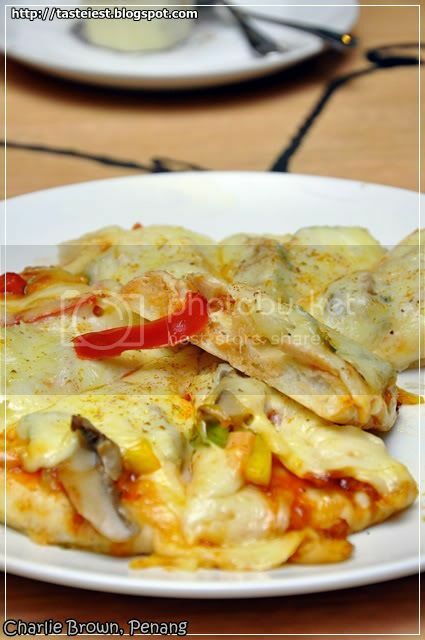 Personally I don’t like capsicum as it has strong raw taste but the rich cheese flavor well covered the capsicum raw taste, the overall taste is not bad but pretty plain. 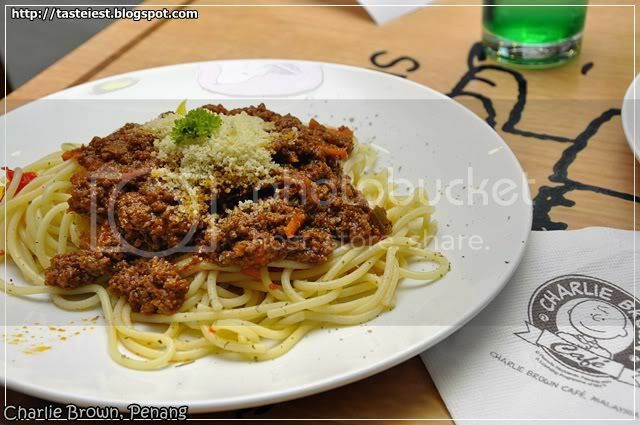 Spaghetti Bolognese Beef, spaghetti nicely cook and tomato beef paste is tasty, if you are beef lover then this definitely your choice as the beef paste has strong beef flavor. What we dislike is the portion, pretty small. 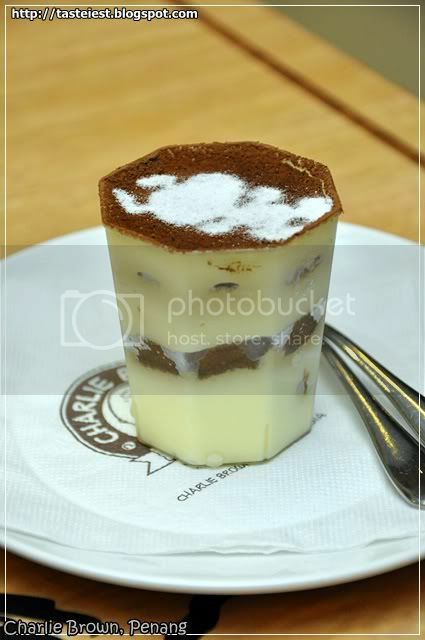 Snoopy Choc Tiramisu RM12, Tiramisu is well presented with snoopy decoration on top of the tiramisu. 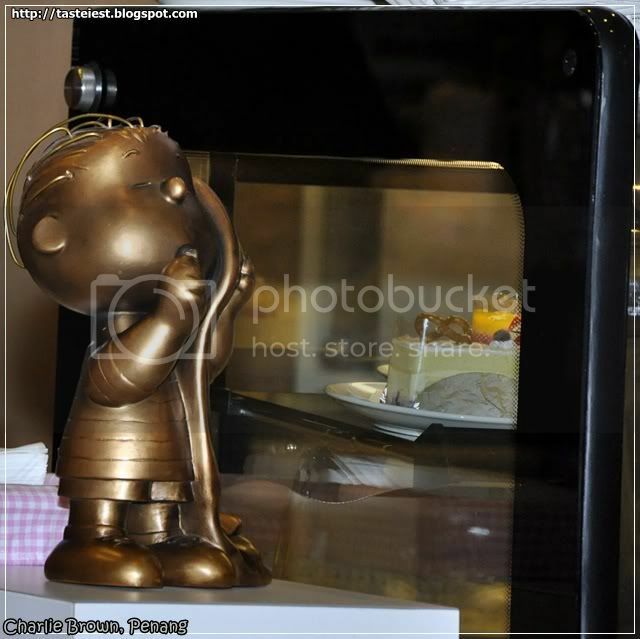 According to the menu it supposed to have a physical snoopy on top instead of some glucose. Dessert is not bad as it had what a Tiramisu should have and it taste like Tiramisu, it taste good but not extraordinary. 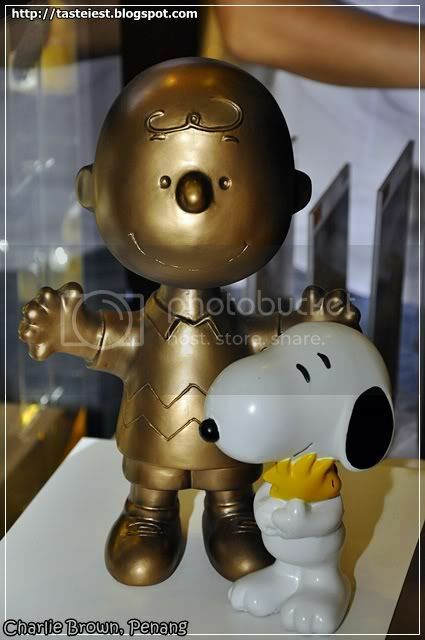 Charlie Brown and his lovely pet Snoopy. 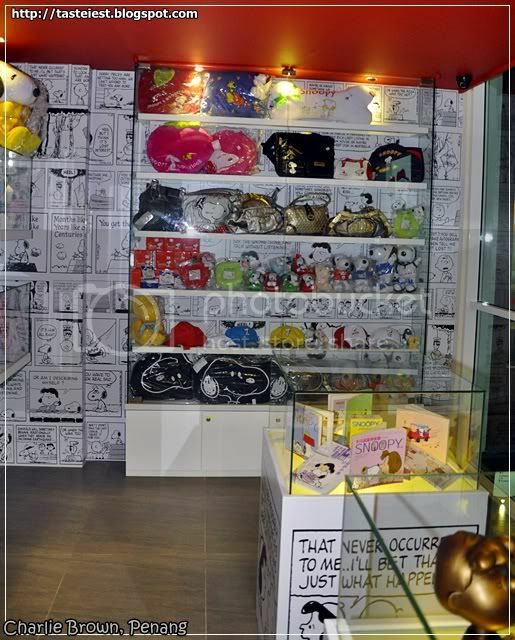 Souvenir corner which variety of bag, shoe, pen, wallet…etc but pretty pricey. 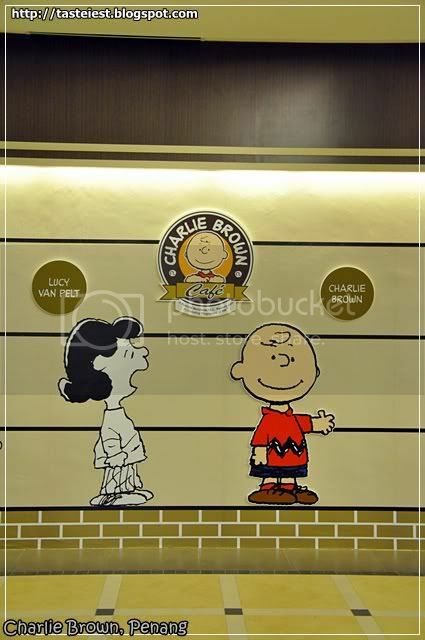 Exterior design fill with Charlie Brown and his friend. 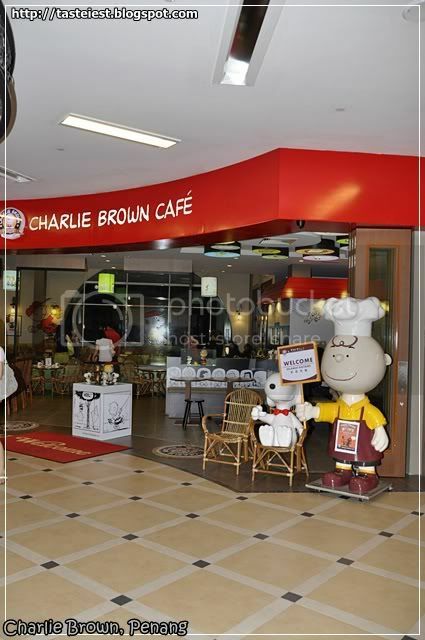 Overall Charlie Brown Café is interesting and great place for chit chat with friend but not for dining as the variety of food is too limited. Hope they increase more variety in near future.